This stream, bounded on one side by flax and tussock, on the other by a paddock, shows the effects of stock having access from paddocks to waterways. The hooves of cattle cut up the river banks, and their grazing reduces stream-side vegetation. 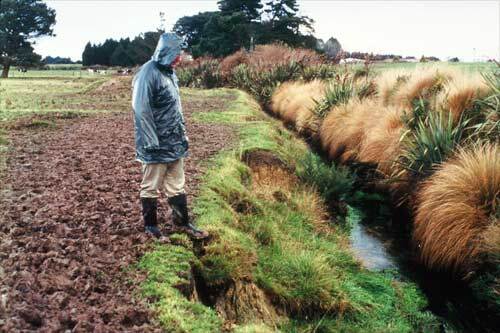 Intensive farming practices can lead to poor-quality waterways and loss of whitebait habitat. Permission to use the image should be sought from the Department of Conservation (Reference: 10060160. Photograph by Ian Welsh). You are welcome to use the information on this page to inform the interpretive panel if you cite the source. Good day. "Whitebait and white baiting..." is suitable for use on proposed interpretation panel in the DoC Waitara River Scenic Reserve, Taranaki. The project is a boardwalk in the form of an eel crossing the wetland. The interp. panel would be mounted on the "fin" near the eel head etched on a concrete viewing platform. The New plymouth District Council has the funding. My question is: given that reproduction of this whitebait information is for public information /education and would not be a published , citing of the soirce would be sufficient? Other related information to be displayed on the interp. panel is to be provided by DoC and the Taranaki Regional Council.